The item More stories from Grandma's attic, Arleta Richardson ; [illustrations, Patrice Barton] represents a specific, individual, material embodiment of a distinct intellectual or artistic creation found in Evansville Vanderburgh Public Library. A young girl delights in her grandmother's stories of days gone by, sparked by keepsakes and simple questions, Grandma shares marvelous stories of mischief , discovery, and laughter, such as a beautiful heart-shaped locket and a curl that cost Grandma more than a lock of hair. 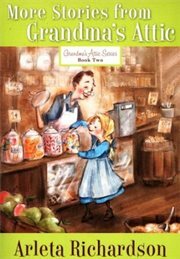 Part of the bestselling Grandma's Attic series, these charming tales-updated with delightful new illustrations-will whisk you away to another time and place. And you'll find something worth far more than any treasure or keepsake...timeless lessons of life and faith!